A few weeks ago, a group of Pilgrims went to a workshop on worship and the arts at Arlington Presbyterian Church. The workshop was led by Carol Marples, an artist out of Edinburgh and director ofSoul Marks, a non-profit that uses the visuals for prayer, worship and community. After a morning of Carol sharing her own best practices, she split us up into small groups. She gave each group a huge, un-assembled cardboard box with the invitation to create a dream sanctuary based on a Lenten theme decided upon by the group. Pilgrims sanctuary with streamers, string, popsicle sticks and a muffin. Looks pretty random. Pretty chaotic. Pretty “what the hell is that.” What I loved about this experience was liturgical daydreaming without abandon. I couldn’t keep up with people’s creative ideas. I watched my Pilgrim peeps flurry around this cardboard square, dreaming “outside of the box” while creating within the box. I left the workshop with my brain jammed with creative thoughts….just in time for…Pilgrims worship planning for Lent two days later. 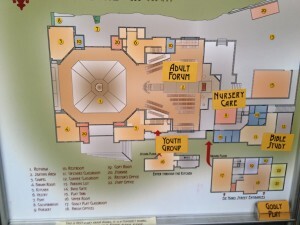 Map of St. Gregory’s of Nyssa, complete with movable pieces to show where stuff is happening throughout the church. I told my colleague, Jeff, about the cardboard box experience and thought it would be great to do something like that for worship planning. Jeff then remembered a map that I saw at St. Gregory’s of Nyssa that was an outline of the church building with movable pieces. What if we had something like that done only for the sanctuary? 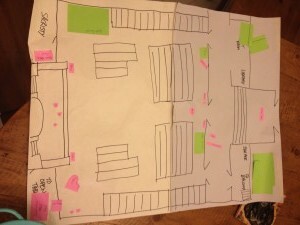 In an instant, one of our interns, Jess Fisher, made a rough draft of a “map” of our sanctuary and had it ready for our Lenten worship planning the next day. About half way through an already great Lenten planning, Jeff pulled out the map and worship planning got REAL. Layout of Pilgrims sanctuary. Note the entrance to Pilgrims building is included that poses the question: Where does worship begin? Mock-up of Pilgrims sanctuary space. What story does Pilgrims sanctuary tell with its architecture, shape, communion table, pews, and font? What was it about using this simple layout of the sanctuary that made creativity in the our worship planning rise to a new level? How is playing with sanctuary space a radical act? Playing with liturgical space gets us “outside the box.” That doesn’t mean we are going outside our tradition, it means we are going deeper INTO the Christian tradition of liturgy. Playing with space calls us to confront how we want to tell the Story. The practice of mixing up the space invites critical, creative, and imaginative thinking. In that worship planning, we were dreaming together with wild abandon. Were we constrained by patriarchal, imperial, dominant ways of planning worship? Nope. Cardboard box + piece of paper (both of which can be composted. FYI)…..it doesn’t take much to mix it up and plan with wild abandon. That’s Gospel living.